DELIVERY OF A SUSTAINABLE BUILT ENVIRONMENT? Geo-Environmental were proud to have contributed to the Discussion Paper “How can we accelerate the delivery of a sustainable built environment?”. 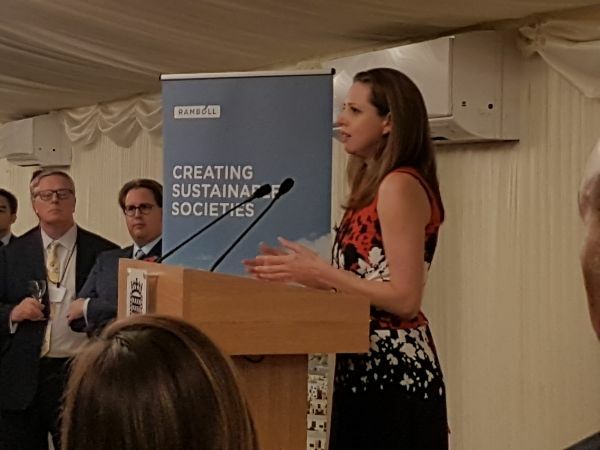 Many thanks to Natalie Cropp from Tony Gee, pictured, who presented the report at ACE’s Parliamentary Reception on 6 November 2018, this paper will frame the activity of the Sustainability group in 2019. The report has been crafted over the best part of a year, but with the recent release of the IPCC Climate Change Report with its stark warnings, it is now especially topical. One of the key issues that it discusses is that in Government, attitudes towards procurement need to change. As an SME we would like to see a system that rewarded Company’s for their attitude to reducing risk, their record on the environment and attitude on providing social value, rather than cost being the decision making factor that overrides all other factors. It is possible to be very cheap if you ignore these additional factors, but is it an attitude that we want to foster if we are going to deliver more sustainable construction projects? How can we accelerate the delivery of a sustainable built environment? The report asks questions and seeks feedback around definitions of sustainability, legislation, governance, measurement and targets, project implementation and data collection.